My friends Pete and Chris were talking about this website and video on Twitter this morning so I went and checked it out. 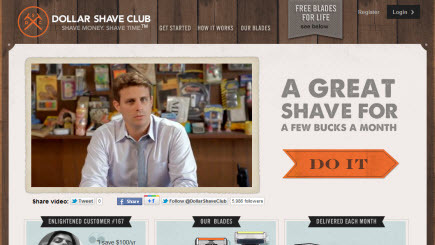 I’m not interested in Dollar Shave Club because I’m a hairy beast.Â Shoot! I couldn’t grow a beard if I used Miracle-Gro after-shave. I’m a shaving cheapskate; one because it takes me about a week to grow some stubble and, two because I’ve been using the same razor blade in my Gillette Sensor for the past 6 months at least. I was just interested in the video because it was funny. It did make me think about doing their cheap $1/mnth razor option though! Doesn’t matter though, this marketing video actually made me LOL. Didn’t really appreciate the non-verbalized expletive in the beginning, but I’ve got to ignore stuff like that on a regular basis anyway. Let me know what you think about the video. Have you used the service? Now, I’ve got to figure out why I’ve been using a Gillette product all these years when their name is on the stadium for the arch-enemy of my Indianapolis Colts!